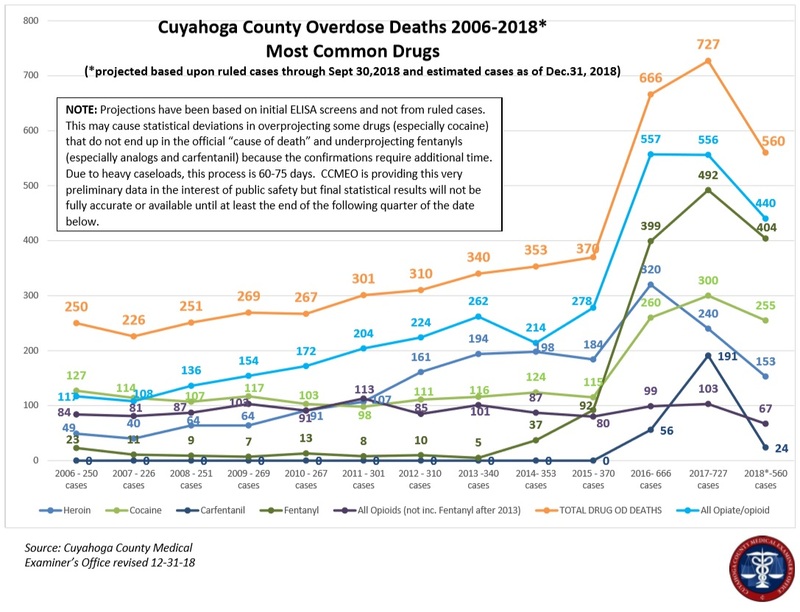 The Cuyahoga County Medical Examiner's Office released the preliminary 2018 drug overdose statistics on January 11, 2018, showing a 23% reduction in fatal overdose deaths last year. The release states this is the first time in a decade there has been a decrease in overdose deaths in Cuyahoga County. While this is a step in the right direction, any amount of overdose deaths is too many. Find the medical examiner's complete preliminary report here. Cuyahoga County Judge David Matia is interested in efforts being made in Wisconsin regarding Medication Assisted Treatment, specifically that anti-addiction drugs, like buphrenophine, are being used as a first response in emergency rooms. He would like the concept to be integrated in the Greater Cleveland Area. "It is my belief that we work towards building similar infrastructure in our area. This may not be the work of our Task Force but I think it is a concept that all members our group, particularly those who work in medicine should be aware of," said Judge Matia. You can find information about the MAT work being done in Wisconsin here. Recovery Resources offers Medication Assisted Treatment. You can find more information about the service here.